The pioneer in micro-loans expands beyond business and applies its crowd-funded model to education. 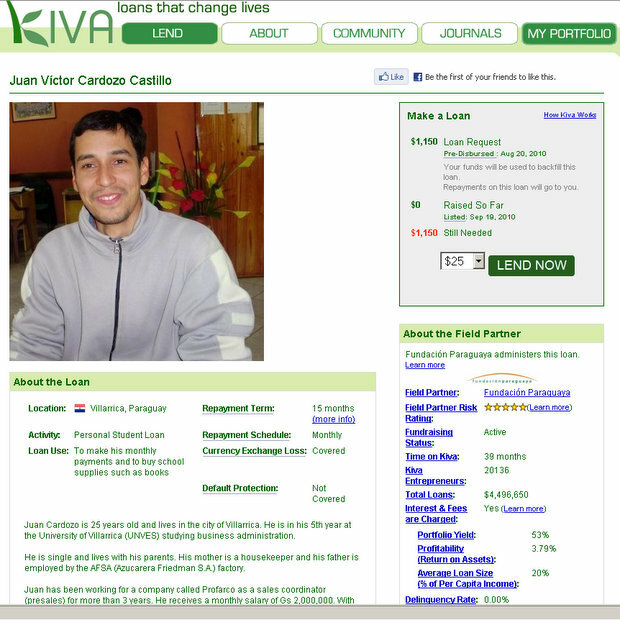 Global micro-lending site, Kiva.org just got smarter. It already allows people from all over the world to donate small micro-loans to entrepreneurs in developing countries. Today the forward-thinking non-profit has announced it’s making available higher education loans for individuals in Lebanon, Paraguay, and Bolivia. The move opens up the micro-lending process from a focus on small enterprises to empowering individuals in developing countries to attend college. The basic Kiva model will continue, allowing people all over the world to make loans as small as $25. After a yearlong pilot program in the three countries, Kiva plans to expand to at least 15 countries. founders). Kiva only recently opened up its site to lending to U.S.
Kiva learned extensive lessons in its early years in Africa and made mistakes along the way, which is part of why the organization is especially strong right now and ready to take this next step. They know that reliable, trustworthy partners are critical, for example, and that’s why the three initial countries–Lebanon, Paraguay, and Bolivia–were chosen. “We’re in a place where our own due diligence is really strong. We believe we have the basic model really working, and this next phase is to do some innovating on top of the general model,” Shah says. Of course money and loans are just part of what is necessary to help individuals learn and grow, and even education itself is just one part of the quest toward global poverty alleviation. Shah agrees that an entire ecosystem must be in place for the full benefits of education to be actualized. OLPC received massive criticism for thinking it could drop computers off into villages without a comprehensive system of trained teachers and formal classrooms in place. Families, teachers, classrooms, and access to funds all form part of the ecosystem that allows individuals to benefit from higher education.